Nutrico is a dispenser for food supplements or medications. Meant to operate in a home environment positioned on the kitchen counter. 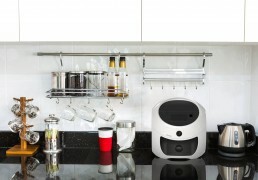 The design of Nutrico is targeted to fit together with other consumer devices in its environment. A2Z-DESIGN has developed the Nutrico device from a concept to a working machine including the industrial design mechanical design electronic design and software.